“Spa Aqua Comb” – specifically designed for the shallow pleated cartridge filters used in most standard spas as well as larger swim spas. How does a Spa Aqua Comb work? Spray your Spa cartridge filter with a quality filter cleaner; let is sit 5 minutes. The cleaner helps kill any active bio-matter on the filter and loosens and softens the body and scented oils built up on the filter. The Spa Aqua Comb combines a flat 3” wide spray that acts like a wall with medium length fingered pic-comb that opens the pleats for the spray to reach in and allow the combs to scrub the pleat walls and dig out the dead bio-material, softened oils and other debris that accumulates. 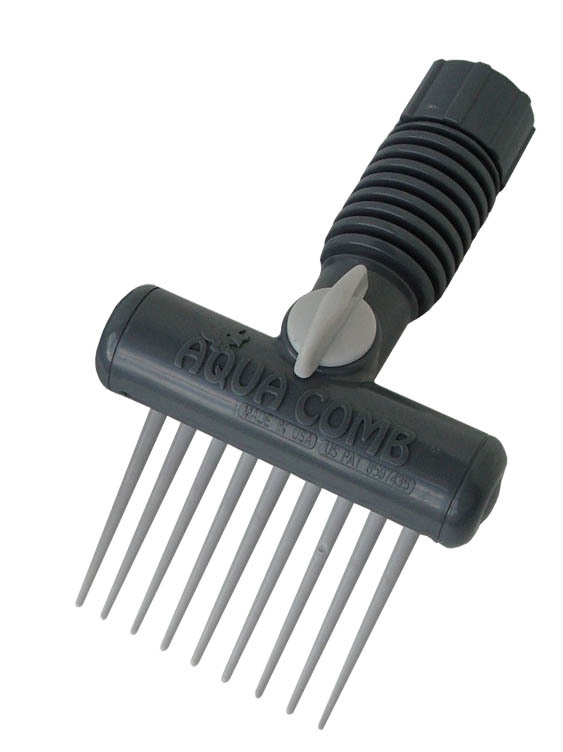 Retailers – Order Your Spa Aqua Combs Today. 1) Trademark name / patented device. 2) 100% made in USA /Sarasota, Fl. Raw materials,assembly & packaging. 3) Attractive colors and designed for ease of use. 4) Works great on both salt and chlorine based water filter systems. 5) Designed and built for long life and use. 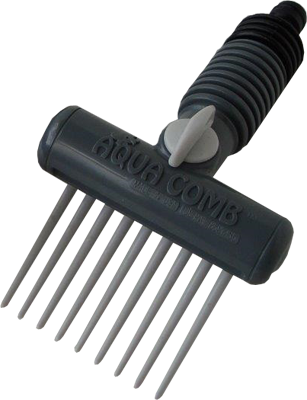 The Spa Aqua Comb is easy to use and will save you both time and money when you more thoroughly clean your spa filter. You will no longer dread this chore! Spa stores often play down the maintenance care side of these fun products. The truth is as reported in the Service Industry News Jan. 15, 2015 addition, proper water and filter maintenance is needed to avoid spa owners and users from contracting diseases such as Legionnaires disease and the more common hot tub rash. The high water temperatures and greater bio-matter load in hot tubs require a much greater attention to cleaning filters and maintaining proper water chemistry. Many ignore maintenance which will also reduce your jet flow action and eventually burn up your jet pump motors. A filter cleaner with a water spray is not enough. The Aqua Comb adds the mechanical scrubbing action along with a filter cleaner that completes the full cleaning process. Work with your pool and spa store to get the chemical balance correct! JUST SNAP ON TO HOSE! Spa Aqua Combs can now be ordered with a quick disconnect instead of the standard ¾” threaded nut. The new attachment system works on all ¾” hose quick disconnect systems sold in Europe, New Zealand and Australia. It is an optional system in the USA for ¾” hoses and in Canada with the ¾” hose Gardena quick disconnect system. Interested in the Spa Aqua Comb?